Below are some of Steve's most popular recent lectures and experiential workshops. It's also possible to In addition to what is here, he can also tailor create a customized presentation for your group or organization. Total Solar Eclipses - Steve is excited about the 2017 total solar eclipse and has offering engaging presentations on the eclipse experience to many different educational and community groups. He's experienced total solar eclipses on four continents and discusses why eclipses happen, what to expect, eye safety, and unique aspects of the eclipse viewing experience that make it a one of a kind event. ​Light Pollution and the Environment - Light pollution is a serious issue that affects wildlife, the environment, and human health. In this presentation lecture, Steve we explores its many effects as well as what we can be done about it as individuals and communities. Presented in lecture format. Recent Results on Cosmic History - An intermediate-level lecture on the history of the universe based on results from recent cosmological research. Presented in lecture format. Contemplative Stargazing – Steve frequently leads stargazing events around the country where he orients people of all ages to the wonders of the night sky and our place in the universe. Presented outdoors. In case of cloudy or inclement weather, Steve can present a slide show on the latest results in astronomy or another topic. 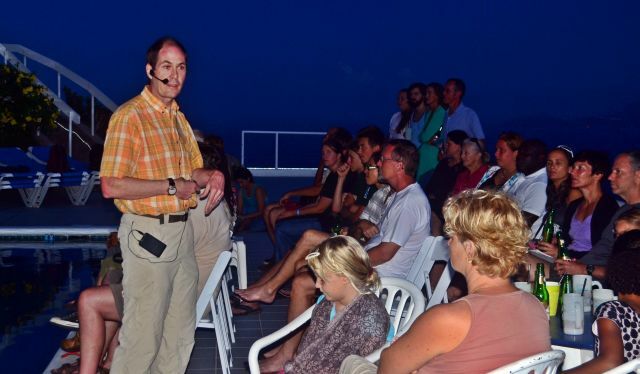 ​ As an educator for over 25 years, Steve presents courses on all aspects of astronomy for the general public and also customized educational experiences for groups of all ages, from amateur astronomy clubs to churches, public schools, homeschoolers, and other community groups. Feel free to contact him for an offering for your group or organization. Some of his most recent courses are listed below. Where did everything come from? How did we get here? Is there life beyond Earth? Join us on a journey to the far reaches of the universe as we explore these questions and more in this exciting new holistic educational series that brings astronomy down to Earth and makes it relevant for everyone. Each session will consist of a presentation of the latest astronomical discoveries followed by discussion and stargazing (weather permitting). No background in science is needed and the sessions may be taken individually or together as a series. Everyone is welcome, so come explore the universe with us! All topics are available to be delivered separately or together as a multi-session course for all ages. Have you ever wondered what’s that star? Looked through a telescope? Been curious about the universe? Join us for an exploration of the treasures of the night sky as we turn our eyes toward the rich collection of constellations, bright stars, and planets that fill the evening skies. Along the way we’ll learn about star charts, telescopes, and how to get started in astronomy. We’ll also explore the myths and stories of the constellations, the lives of the stars, and the latest theories about our place in the universe. Available to be presented in a single evening or multi-session format. This course explores some of the most exciting and transformative discoveries in modern science and how they are revolutionizing our ideas about space, time, and our place in the universe. Course topics include quantum physics, relativity, chaos and complexity theory, systems biology, and consciousness studies. Course topics can be presented in a single session or in a multi-session format. How do we find our way forward as a society and culture during this revolutionary moment in time? This course explores some of the most innovative ways of thinking and living are being explored and implemented. Course topics include integral philosophy, consciousness studies, ecological and green economics, holistic approaches to education, indigenous approaches to science, and others. ​Steve has also had good response from his book Cosmic Conversations, and often gives talks on the results from the book to groups and organizations. He also leads group discussions based on the book that explore the question “What is the Universe?” from multiple perspectives that embrace scientific, spiritual, and cultural viewpoints in an engaged and transformative way. Through participating in conscious dialogue and open engagement with questions about the universe and their place in it, many people find new insights about themselves, their lives, and the world around them naturally arise, along with a deep connection to themselves and others. Through the dialogue process, people’s beliefs about themselves and the universe are gradually transformed, leading to a greater sense of connection, purpose, and appreciation for themselves and this mysterious universe.